unny Intwala, M.D., is a third-year cardiology fellow affiliated with Boston University School of Medicine and a clinical exercise physiologist who works in the ABC News Medical Unit. The Baikal Ice Marathon is a standard length marathon: 26 miles long. But there is nothing standard about where those miles are run: across the frozen surface of the deepest lake in the world, Russia’s Lake Baikal in southeast Siberia. The marathon takes runners across from the lake's eastern shore to its western. In March, when the marathon takes place, the ice is a meter thick and stretches iron-hard and flat across waters that in places are a mile deep. Early spring temperatures on the lake are locally considered mild -- around 14 degrees Fahrenheit. But they can -- as they did this year -- drop to minus 20 Fahrenheit. Gale-force winds can blast across the lake, whipping up huge spiraling clouds of ice that burn the face and eyes. In such winds, frostbite can occur within half an hour. Each year, 150 people sign up for this test, traveling from around the world. They stay in two small towns near the lake. The ice is thick enough to support cars but participants travel to the starting line by hovercraft. Among those running is Alicja Barahona, a 64-year-old resident of Greenburgh, Westchester, just outside Manhattan, and about 6,000 miles from Baikal. For the past 20 years, Barahona has been running ultramarathons — extreme long-distance runs usually over hundreds of miles and often in exceptionally harsh environments, such as deserts and mountain ranges. Originally from Poland, Barahona moved to the United State in 1990. She only started running in her 40s. At first, she challenged herself to run a loop around her local high school. Within a year, she completed her first conventional marathon, the New York City Marathon. Then she graduated to extreme ultras, starting with the Marathon des Sables, a bone-grinding 150-mile run through deep sand in the Sahara Desert in Morocco. Since then, she has lost count of how many ultramarathons she has done, completing hundreds of 50-mile races and running some of the most remote marathons in the world. She has run 350 miles alone on Alaska’s Iditarod Trail in -40 degrees Fahrenheit weather-- three times. She has run a 208-mile race through the Sahara six times. A 145-mile race down England, three times. Her longest race, the Trans 555, was a 400-mile non-stop, self-navigated ultramarathon across the desert in Niger. She has suffered frostbite racing in Alaska; in the Canadian Arctic, she almost froze to death. And in middle age, she has also won almost every ultramarathon she has participated in. 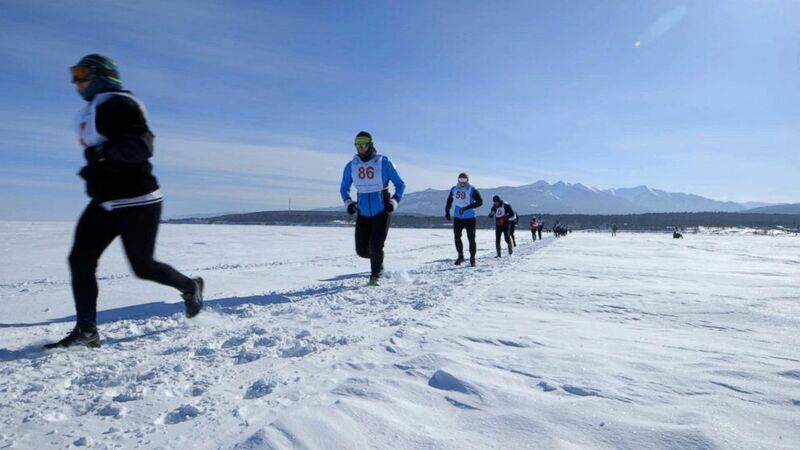 Runners taking part in the Baikal Ice Marathon in Siberia. So for her, 26 miles is a short run. “It's not my distance. I am an extreme ultrarunner,” she said. “I don’t have a great speed for short distances, but I have enormous endurance." Barahona insists that, physically, she is nothing special. She is not a professional runner. She works full-time at a pharmaceutical company. She doesn’t have a special diet. Ahead of long races (200 miles or more), she does a lot of what she calls "short races" -- 50 kilometers-plus (about 31 miles), in the month before. When she's preparing to race with a sled in a solo event, she practices by running around her neighborhood with a tire tied to her waist. 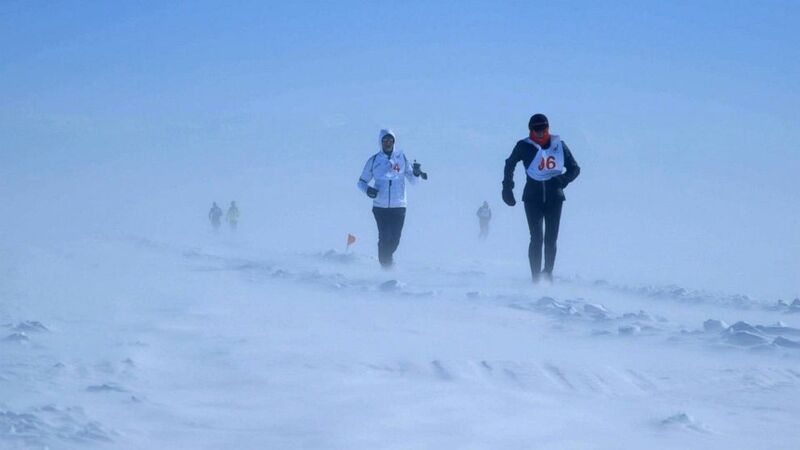 Runners run through blizzard conditions during the Baikal Ice Marathon in Siberia. 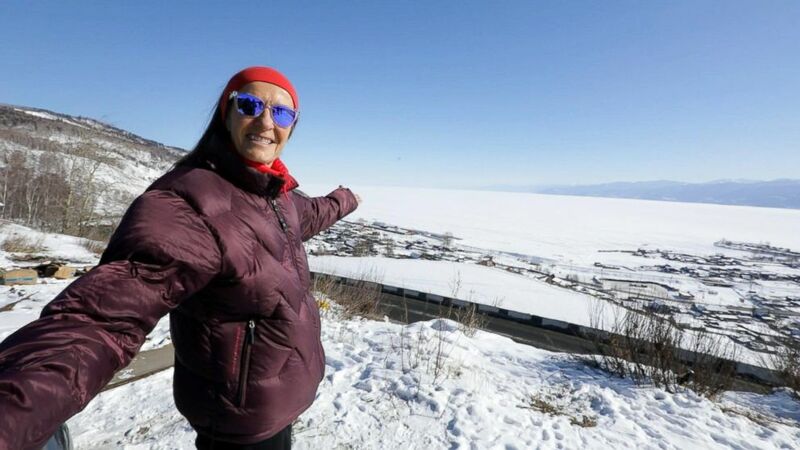 This year’s Baikal Ice Marathon was also a trial run for her, ahead of a planned attempt to run the lake’s whole 400-mile length next year with a partner. As with her previous races, she was raising money for charity by making the run, this time for the Hudson River Sloop Clearwater organization, a nonprofit organization that works to clean up the Hudson River. The attraction of such runs, she said, is to test herself, alone. "I like to depend on myself. So these unique, extreme condition places have special appeal to me. I think it is that you become like part of the nature, when you are in such an environment. You don’t have cars around you, you don’t have the noise around. I think these extreme races allow you to be alone with nature." 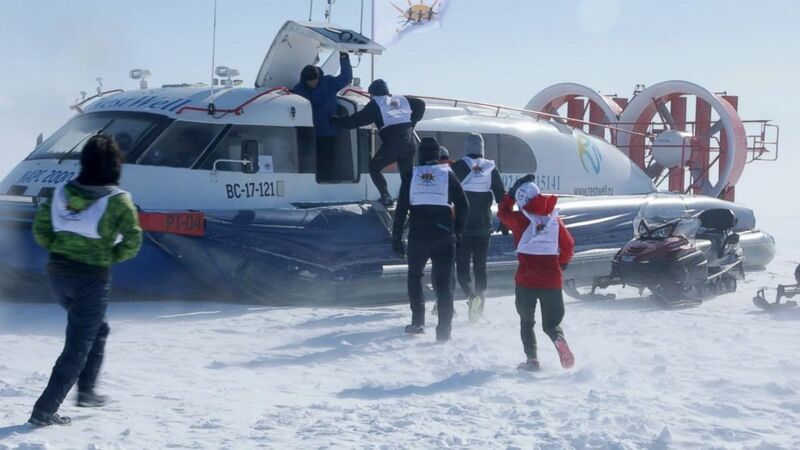 Runners are evacuated via hovercraft after the Baikal Ice Marathon was postponed due to inclement weather. Lake Baikal is a unique place. It contains one-fifth of the world’s freshwater, more than the five Great Lakes of North America combined. Its waters are exceptionally clear and home to so much unique wildlife the lake is sometimes called the "Galapagos of Russia." The lake's remarkably clear waters mean its ice is almost perfectly transparent. As the snow cover blows away, it reveals polished onyx-black ice, veined with white cracks. Gas that bubbles up from below freezes under the surface. Seen from above, a runner on the ice looks as if he or she is jogging through space. Watch ABC News Features’ latest film and follow Alicja as she tries to run the ice of Baikal.